Race against a friend or family member on the Floating Ball Game by manipulating air flow with bendable nozzles to redirect the ball from one end of the inflatable to the other. This is a wonderful simple game for any occasion. The fun feature about this game is the "magically floating" ball. Due to the upward air pressure the ball floats above the first cone. The interaction that kids and adults love is controlling each cone's air flow to move the floating ball to the next cone until you reach the last cone! If the ball drops then you're back to the first cone trying to catch up! Race against your friends and you've got a competition that everyone loves to play! The competition can be a single round or a series of eliminations leading to the Floating Ball Challenge winner! 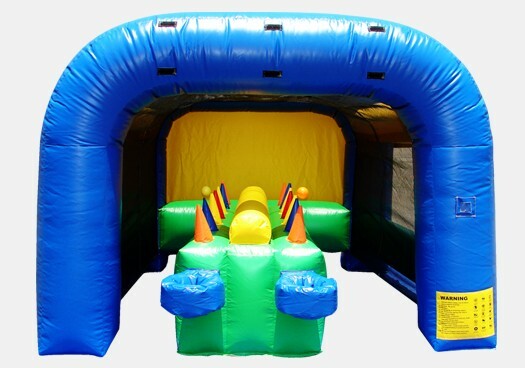 Play all day and compete against each other with the floating ball challenge commercial inflatable sports game. This unit is great for any rental business, church, school, or other organization!